Marketer Suggested Content lets you control the message on an Article-by-Article basis by providing Creators up to three brand approved content options to share. For Marketers with high brand sensitivity, you can also choose to disable the Creator's ability to write custom content. Any of these settings can be changed while the project is active in the platform. 1. Click into the Project where your Article is located. 2. Select the Article you would like to adjust. 4. You will have the option to provide the Creators with three content choices. The first suggested content option will be the Article title however, you are not required to use it. 5. To add other suggested content options, select Add Suggestion. In total you may have up to three options. 6. You will also have the option to disable the ability for Creators to provide their own content. To disable custom content, select check box next to Disable Custom Content. 7. Once you have added all of your content options, select Save. 8. Any new Creators that take this Article will be given your three pieces of content to choose from. 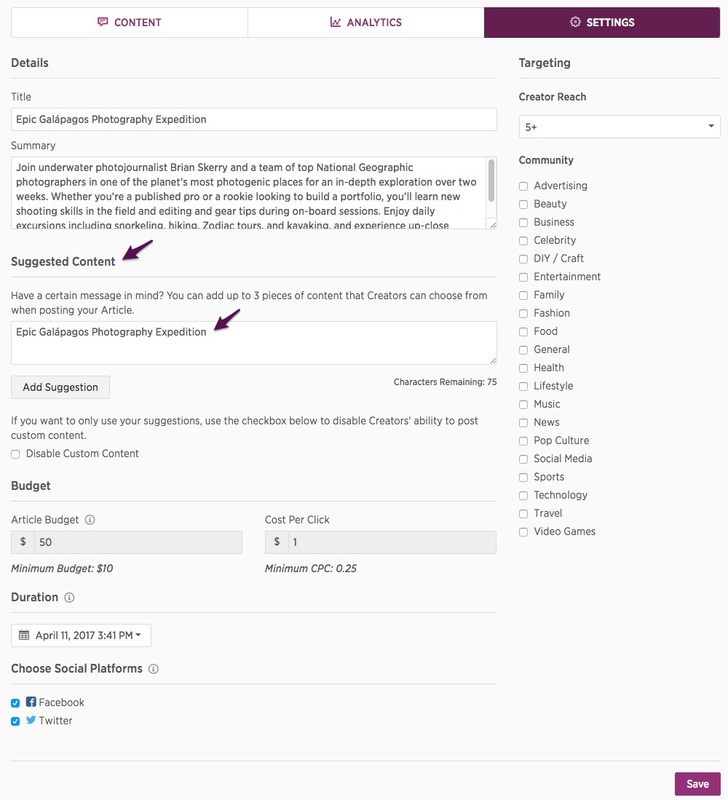 Any Creators who have taken your Article prior to this change will not be provided with the suggested content and will be able to create their own content.